Sunlight streams through the window pane unto a spot on the floor…. then I remember, it’s where you used to lie, but now you are no more. 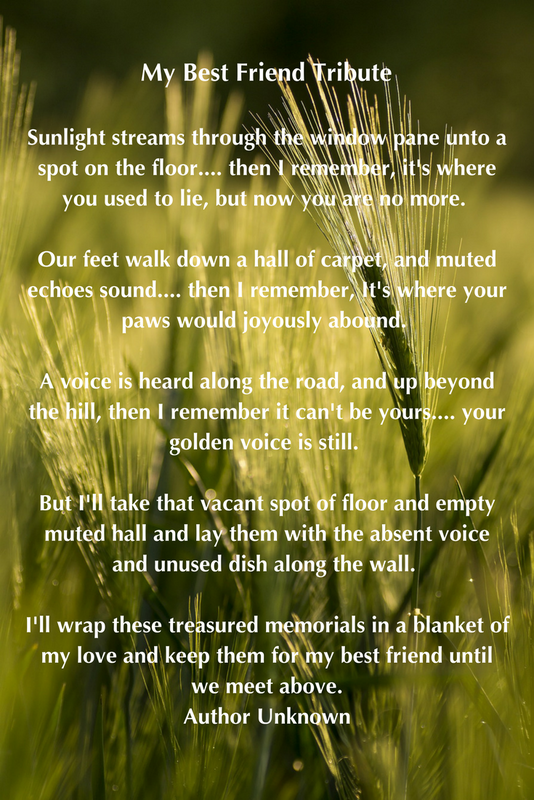 Our feet walk down a hall of carpet, and muted echoes sound…. then I remember, It’s where your paws would joyously abound. A voice is heard along the road, and up beyond the hill, then I remember it can’t be yours…. your golden voice is still. But I’ll take that vacant spot of floor and empty muted hall and lay them with the absent voice and unused dish along the wall. I’ll wrap these treasured memorials in a blanket of my love and keep them for my best friend until we meet above.